350 pages of pure viking awesomeness! 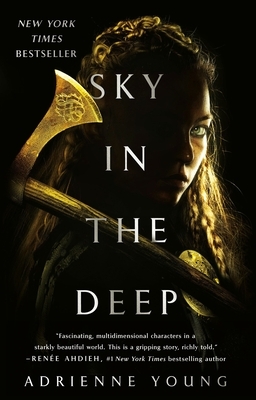 Sky in the deep is set in a richly crafted world, and follows Eelyn as she is captured by a rival clan and discovers her believed-to-be-dead brother is alive and living with her enemies. While there's plenty of action, the book shines in its emotionality and the well developed characters that leap off the page. The writing is as beautiful as the cover and by the time you finish, it will seem as if you didn't just read about a village nestled in the mountains--but that you stood in its forests and waded in its streams.